Follow your dream, that’s obviously what Paul Plant did five years ago when he started his publication ‘Sub Tropical Gardening’. 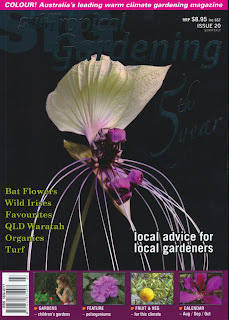 It took a lot of courage from the outset to envision a high quality publication that catered to the sub tropical regions, it would either be a complete failure or a great success and what made matters worse was that the magazine was started in one of the worst droughts ever and gardening especially in Queensland became a dirty word. Well the magazine has now reached its 20th issue and it seems to have found a real niche in the market. 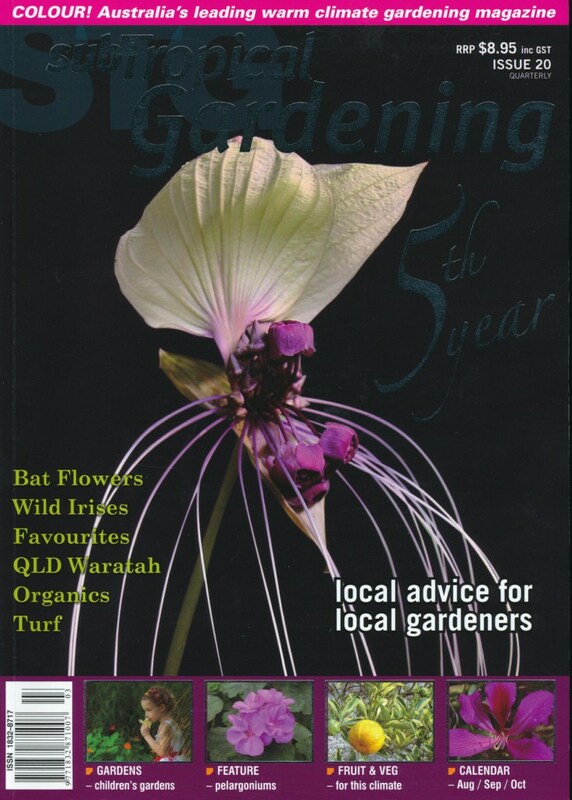 We are never too young or old to learn something new and this magazine will give you interesting information to help you become a better gardener. I have never subscribed to the magazine but have most copies including number one, I usually flick through it at the newsagent’s then buy it. It is a high quality glossy magazine that looks good but sometimes disappoints me with the contents; OK I know I am biased and have my favourite type of plants, but I do realise there are other people with different interests to mine, so what does not interest me interests others. One thing I do not agree with is that Horticulturists should be the only contributors to articles, there are some dedicated garden people out there who could make a great contribution, for instance, John and Genny Catlin from Jacobs Well, their plant knowledge is so vast that it should be written down because I know of no one else who has their scope of knowledge of warm climate plants. My favourite part of the magazine is ‘Sub Tropical Collector’ I find this great to identify plants and learn about them. If you keep the back copies then there is a great search/index function on the STG website. Overall it’s a great magazine for warm climate gardeners. Thanks Ian for your frank post. It is good to be honest on your posts. The Australian website is www.stgmagazine.com.au, but the .com site will bounce to the .com.au site. The section 'Subtropicalia Collector' is indeed one of the focus sections of the magazine for serious gardeners. I agree that many (many, many) non-qualified gardeners are a wealth of information and personally never underestimate their depth and bredth of knowledge. I also note that every magazine has a criteria to which they apply for their writers - some more stringent than others. Luckily this all gives the public diversity. I love STG and even though I live in far NW NSW,I find many articles relevant to my area and get a real buzz discovering I already have in my garden many plants featured. I wish it came out monthly. It is the only gardening magazine I always buy. Many others now seem so full of ads but STG offers so much practical info and I now share with a gardening mate.